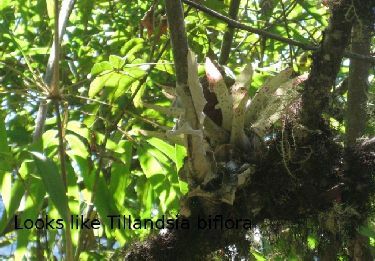 The following series are from the Tillandsia discussion group, started by a question from Andrew Flower, NZ. 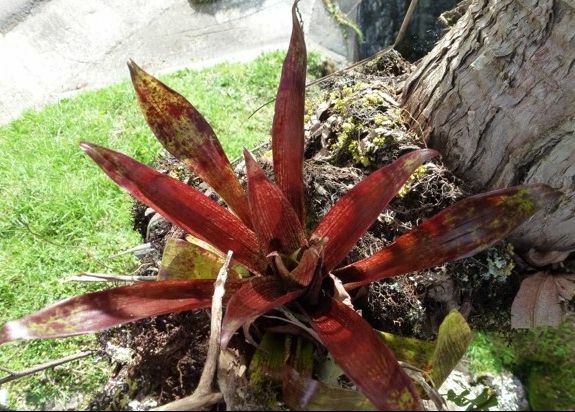 Andrew Flower, 04/09/12... "Are there red-leaf and green leaf forms of T. biflora, or are the differences appearing in the pics on "the DVD"caused by environmental factors? My buyers have asked whether they are the red leafed form or the green leafed form. My plants are all grown from seed and kept warm, wet and shady. 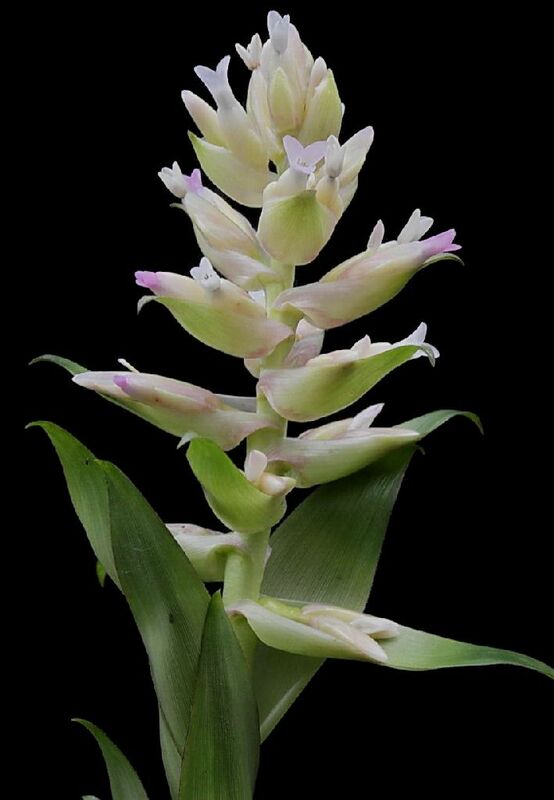 They grow, flower and set seed readily, and have green leaves. 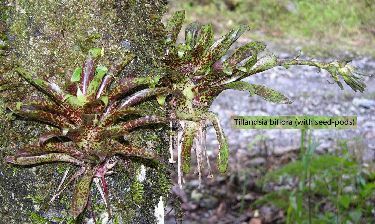 I have the idea that when this species is growing naturally at the 2-3000 m levels it has deep red leaves, due to the high levels of UV, but if you bring the plants down to lower altitudes in cultivation the leaves will turn green. Whilst predominantly green leafed, if the seedings I grow here get moved out into higher light they do start developing the "red splotches" you see on many of the pics on the DVD. When they do colour up here they are nothing like the Die Bromelie 2 2004 p.522 pic on the DVD, more like the two "ex Bol" pics. 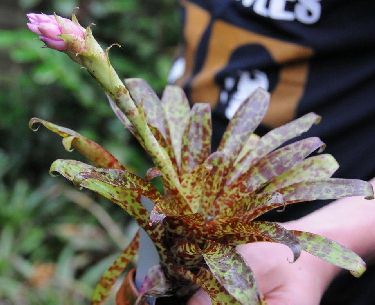 So - are there genetically distinct red leaf forms and green leaf forms of T. biflora, or just variations in leaf colour caused by environmental factors?" Bob Hudson, 05/09/12... "Here are a couple of photos of T. biflora at Macchu Piccu, one is red." 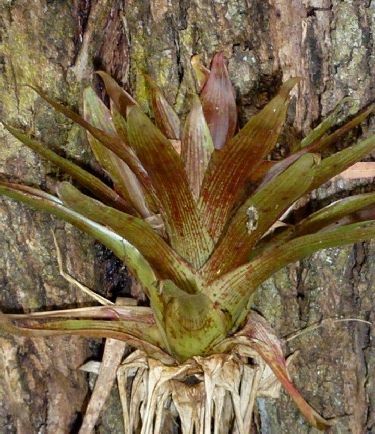 Bruce Dunstan, 05/09/12... "I can only comment on what I've seen in the bush as I don't cultivate T. biflora. At lower elevations in Panama they tend to be green plants and as you head up the hill and with more exposure to sunlight they tend to get more colour whether it be stripes or spots. The attached were near Yarumal in Antioquia Colombia much higher. 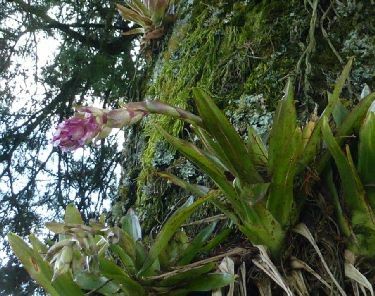 The flowering plants were in a shady spot growing on the trunks of a conifer that cast heavy shade. The stripey plant was in a more exposed position. 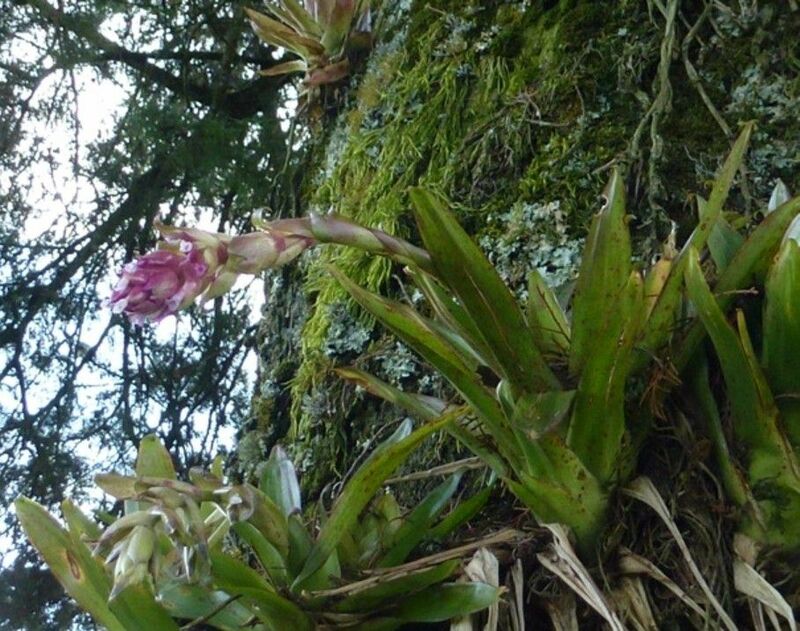 Len may have more on this as he has seen some very spotted forms in Ecuador at higher elevations I'm betting."" Peter Tristram, 05/09/12... "The spotted form, shown in habitat by Len and coveted by collectors, is more difficult to grow than at least 1 of the plainer forms that I got from Knize, probably from Peru. It reminds me of both of the forms posted by Bob and Bruce. Each year (now) they flower, produce 1 or 2 pups and 1 or 2 die so I still have just a few plants like I started with, unless someone has got seed I sent to Eric to grow. The beautifully spotted form is like that in cultivation but can't take extremes though I am stupid enough to keep trying when I can get hold of one. Some pics attached of my easier-to-grow form, a spotty in Jan Klaus's collection in Berlin and some at Peter Bak's in The Netherlands. Once a spotty red always a spotty red, I'd say. Len, and some others of us, have seen many forms in habitat and in cultivation too and might offer their observations." Peter Tristram 09/12. Peter Tristram. Spotty. Peter Tristram. Bak. Bruce Dunstan, 05/09/12... "More exposed plants at Yarumal. I like those spotty ones Peter." Peter Tristram, 05/09/12... "No doubt altitude increases pigmentation in biflora like in most other higher-altitude broms, it's well known that most 'red' plants go green at sea level. As well as that we fertilise and grow them fairly moist, in lower light, to keep them cooler, so it is in winter when they colour best. This applies to the likes of the more common guatemalensis, deppeana, yunckeri, imperialis and so on which colour up best in winter when there is a diurnal range from below 10 to maybe 20 (unless in Victoria!) The nights have to be cold to enhance the pigmentation. I found a scan of an old photo of biflora taken in the '80s. 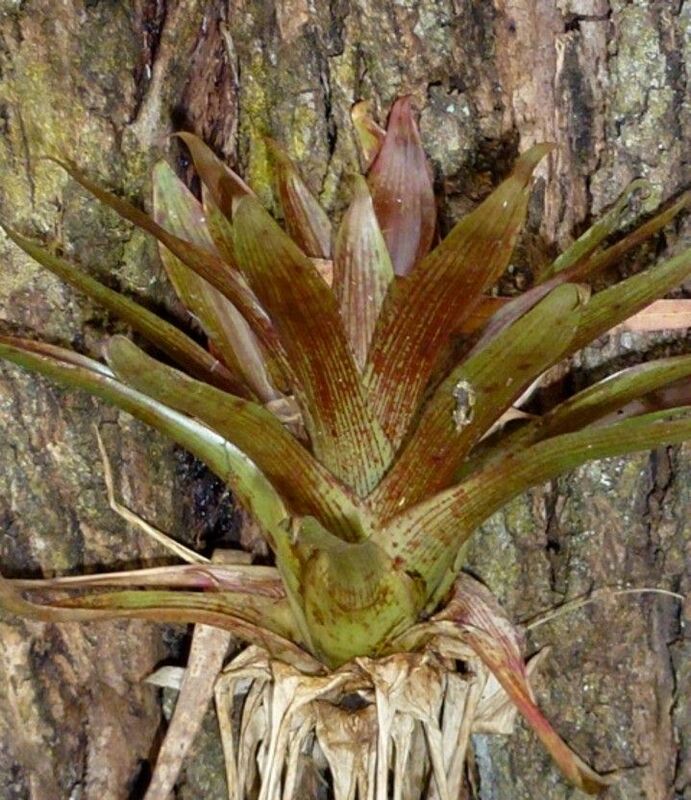 I had a few of these for years, along with my collection of Werauhia and Racinaea, then they all died during a hot summer when I was away and the watering system failed. I got the plants from Jeff Kent and I'll be visiting him in a week or so - never know your luck!" Bruce Dunstan 09/12. Peter Tristram 09/12. Brenton Cadd, 05/09/12... "Peter, I know that Peter Bak has huge climate controlled green houses, do you know what temperature and humidity he would be keeping those beautiful T.biflora and R. crispa, which are in the back ground of your photo, at? It must cost an absolute fortune to keep the temperature and light up to those plants during their winters. It would also seem that air movement is not a big issue around the R. crispa's the way they are stacked into the trays." Chris Larson, 05/09/12... "Brent: Once they are going well and kept with a good minimum temp (12-14C), I find crispa fairly easy & tolerant of humidity levels. On the other hand I find T.biflora is a tricky thing. 1. I may be heavy handed, but the stem is so soft that removing the central pup (I did it on 2 separate occasions) killed the mother even when there was heaps of food value left in the mother - my evaluation was that I bruised the cut, and I was careful - I won't do this again as both the pups were very slow to establish. 2. Moving the plant to a different spot, which I thought had very similar conditions, killed one. 3. One of my plants has just started throwing a number of grassy pups - looks like the centre has rotted. 4. My seed of the Knize form never came up." Peter Tristram, 05/09/12... "I agree with Chris about biflora and am loath to remove pups now. 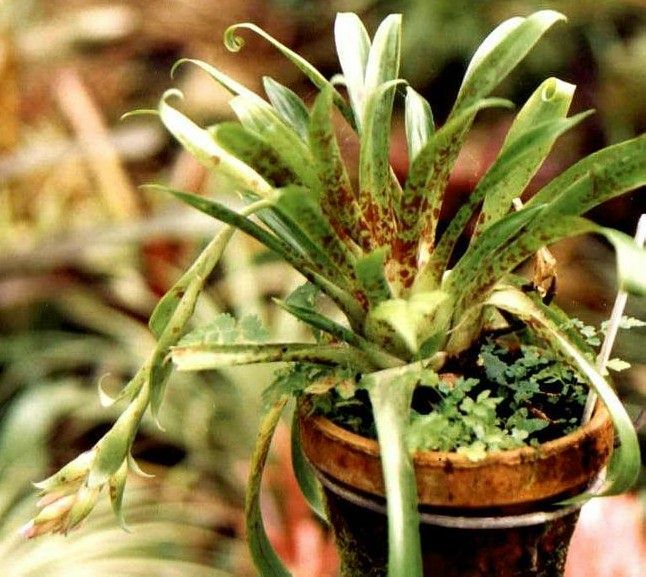 I have had crispa on many occasions, flowered and clumped them and lost when they dried out unexpectedly. I imagine Peter would keep the Corn Bak greenhouses somewhere between 15 and 30C and water regularly. The greenhouses are huge so there is plenty of air always moving around so nothing stays damp - ideal for no leaf damage but impossible where I live. 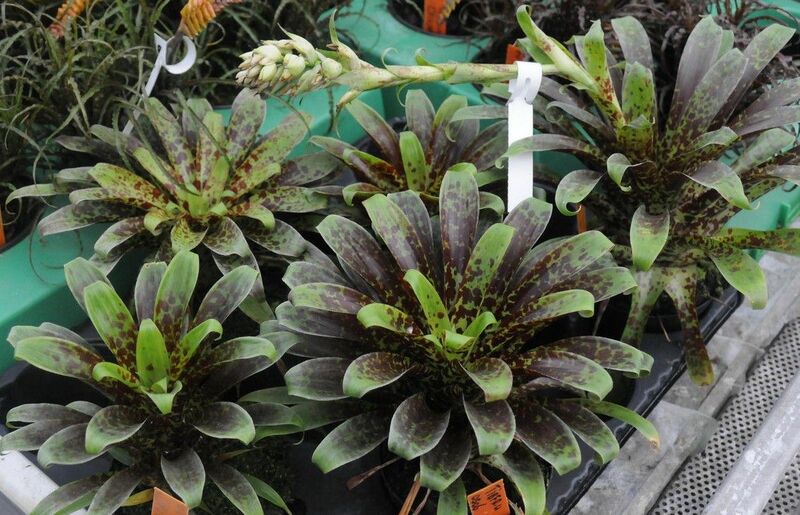 Frank Hoepfel, in Germany, grows his T. biflora sort of stuff and Racinaea species very differently. 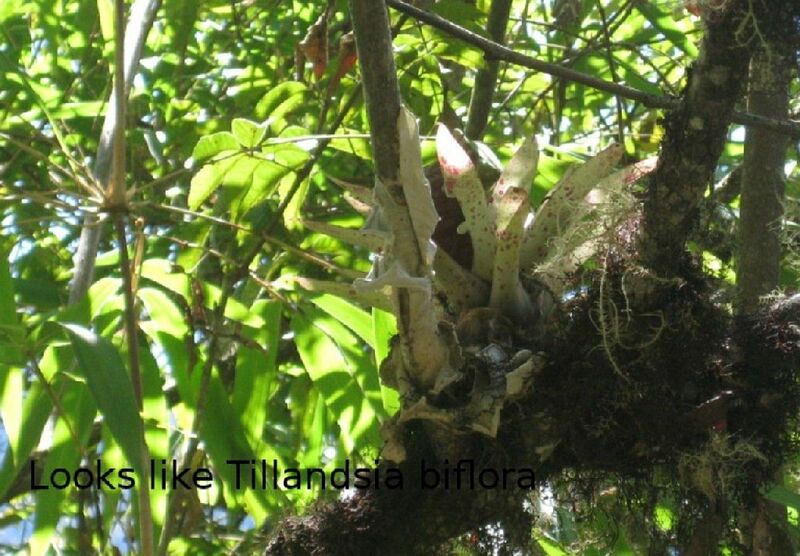 Both biflora were from the same area in Ecuador. They are mostly in the garden over summer a la Frank Hase, in the grasses and weeds for one and in his tiny glasshouses over the long cold winter (near Leipzig). They look pretty damned good! But most of what I got from him (and Dorothy Hase -Frank passed away) died whereas Peter B's plants usually live." Peter Tristram 09/12. "Lines", Frank Hoepfel. Peter Tristram 09/12. "Spots", Frank Hoepfel. Len Colgan 09/12, in habitat. 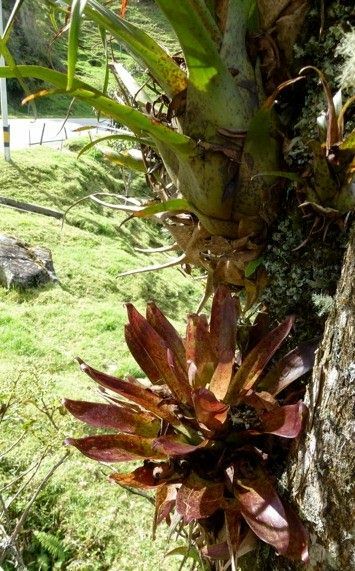 Len Colgan, 05/09/12... "Yes, I did see countless T. biflora in Ecuador, as it is one of the most prolific bromeliad species there. 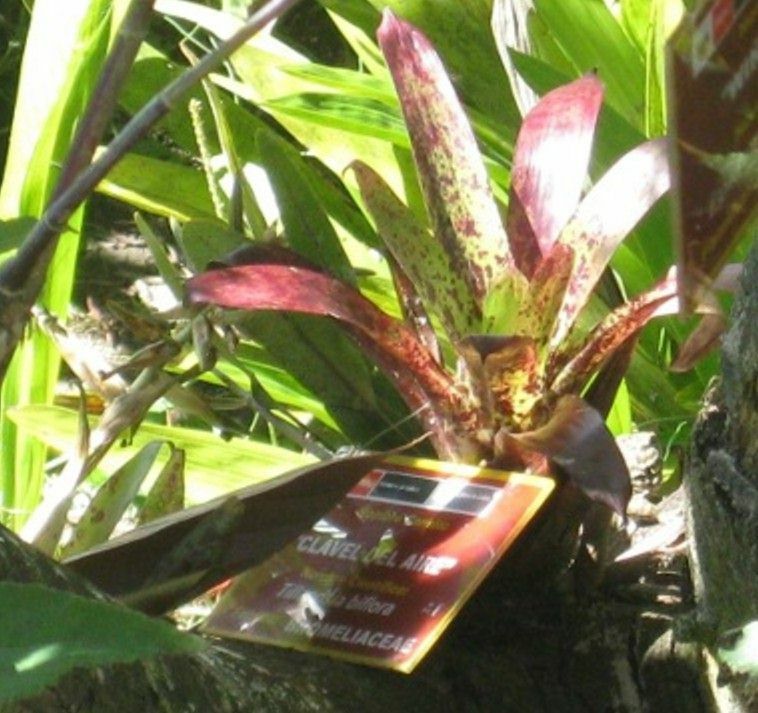 My travel companion has a broad collection of this species, as he rates it his favourite bromeliad. In fact, it is the number one reason why he left Germany to live in Ecuador. There are basically two types of T. biflora, as evidenced by Pete's pictures. 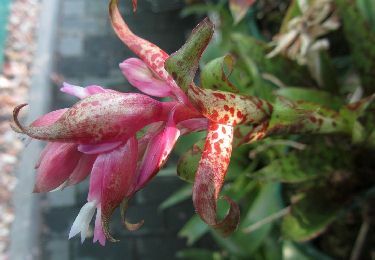 The more common form is the heavily dark spotted one with rounded leaf ends. 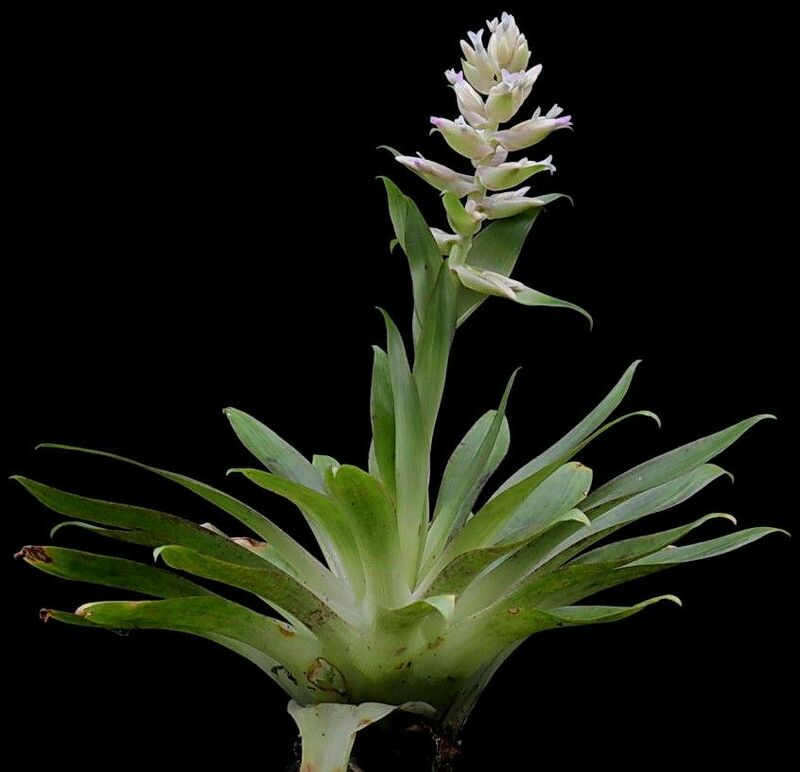 The slightly less common form has fine lines running along the leaves which are somewhat more pointed. Both forms can be found at similar elevations." Derek Butcher, 06/09/12... "Andrew, I think you were correct in your statement 'just variations in leaf colour caused by environmental factor' There may be a genetic advantage with red spots in these higher altitudes but how do you prove it? Even if your Asian contacts imported the red spotted plant from habitat the colour may soon disappear. Growing from seed would also favour the greenness. I am often getting identity queries from this region where the plants always seem to grow bigger, are reluctant to flower, and have delightful greenish hues. 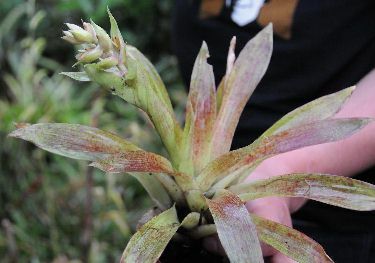 Even T. ionantha when in flower do not seem to get that vibrant red in the leaves. So if you want to grow T. biflora with leaf contrasts find your closest mountain."